In today’s busy world, there is perhaps no better way to share knowledge than through short but powerful presentations, which is the idea behind TED Talks. And so, in keeping with the theme of collaboration that has been its driving force, CHIME hosted its own version of the Internet sensation by having three CIOs share best practices in the areas of population health, security, and patient engagement, in 12-minute segments. The goal was to make it more about storytelling and “ah-hah” moments, and less about pointing to graphs on slides. The result was a packed room, where audience members were riveted by what Marc Probst, Craig Richardville, and Rodney Dykehouse had to say. Kicking off each presentation was Judy Kirby, President & Executive Recruiter at Kirby Partners, who discussed the evolution the CIO role has undergone in recent years from “techie” to implementer to strategist. Now, the department that was once hidden away in the basement is charged with innovating, leveraging data to improve outcomes, and keeping that data safe, she said. Part of the challenge with innovation isn’t in finding the next big idea, but rather in dedicating the time and energy that’s needed to bring those ideas to light. According to Kirby, 40 percent of CIOs have no innovation budget or have seen a decline, and of those who do have an innovation budget, half say it hasn’t increased. The good news is that innovation doesn’t have to mean developing cutting-edge technologies, according to Richardville, who tackled the topic of patient engagement. It can mean leveraging tools that already exist to increase care quality or improve processes. At Carolinas HealthCare System, where he has been CIO for nearly two decades, technologies like check-in kiosks, palm vein scanning, apps, and virtual visits are resulting in higher levels of engagement and satisfaction. And the OpenNotes initiative that was “a challenge to push out to clinicians” is being used by 90 percent of patients. Next to take the stage was Probst, CIO at Intermountain Healthcare and current CHIME Board Chair, who touted the benefits of analytics, something that is still not a key priority for many organizations. According to Kirby, 60 percent of health IT leaders surveyed say they aren’t doing “anything substantial” with analytics. Probst hopes that more organizations will take a cue from Intermountain, where the goal is to use data to prompt clinicians at the point of care through technologies like machine learning. “It’s going to transform how we do analytics and how quickly we get answers, he said. 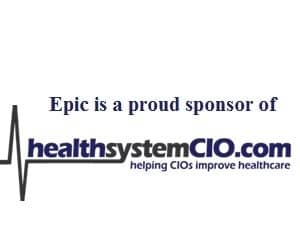 Finally, Dykehouse, who has been CIO at Penn State Hershey Medical Center since 2012, spoke about the importance of a solid security strategy. When the organization was hacked in May 2015—an incident that drew a great deal of negative press — it was “a wake-up call,” said Dykehouse, who said CIOs need to “own cybersecurity” and become more proactive when it comes to negotiating with vendors. “It’s our obligation as CIOs to take accountability and responsibility, in partnership with the chief information security officer, to drive these things and put the right policies in place and the necessary language in the contracts,” he said.